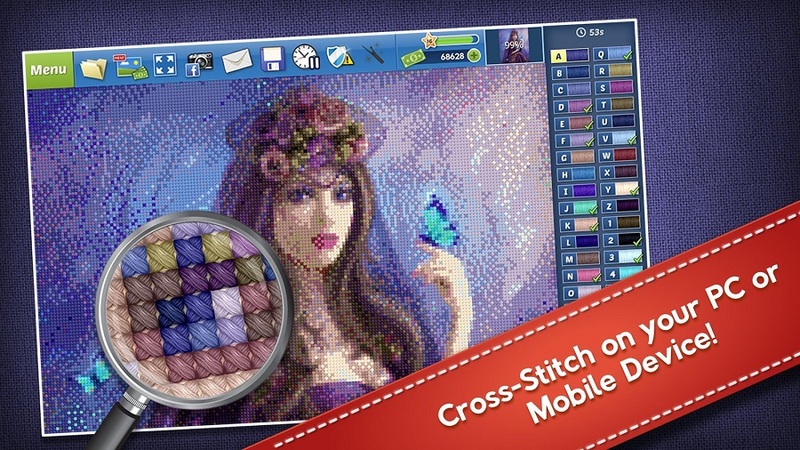 If you enjoy activities such as coloring in adult coloring books and playing Sudoku, you may be interested in trying out Cross Stitch for PC. 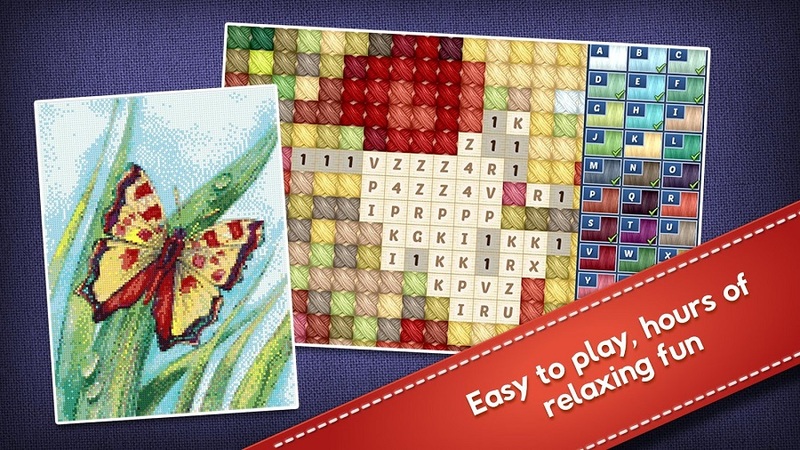 The game is addictive, which allows you to experience the thrill of completing your own cross-stitch images, without having to pick up physical cross stitching needles. You may be wondering how it’s possible to cross stitch an image using an app. In Cross Stitch, you’ll get to zoom in on tiny squares which make up an image, which you’ll be able to fill in with a variety of different colors. Each square that you see will feature a letter, which will correspond to a different color thread, which means that it’s impossible to choose the wrong color thread for a square. Once you’ve finished coloring in each square and zoom outwards if you’re lucky you’ll be able to see a finished work of art, which you’ll be able to be proud of. 1. Six different categories of images to choose from. 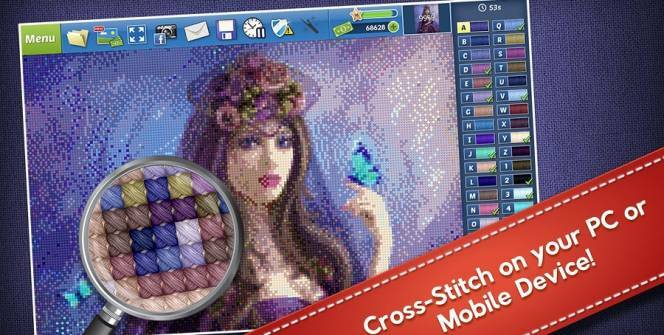 Each time you play Cross Stitch you’ll be able to select a new image from one of six categories. Animals, flowers, people, pets, landscapes and artwork. So no matter whether you’re more interested in digitally cross-stitching a famous work of art by a world renown artist such as Monet or Van Gogh or you’d love to virtually cross stitch your favorite animals, you’ll be able to find an image which you’re interested in completing. 2. Brand new patterns are released on a weekly basis. If you become addicted to Cross Stitch for PC and complete all of the available patterns, there’s no need to worry as new patterns are released every week, which means that you’ll have no trouble feeding your digital cross stitch addiction. 3. You’ll be able to import all of the images which you complete to save and show to all of your family members and friends. Once you’ve successfully completed an image which you love, you’ll be able to import your image to your selected image to your computer. So that you’ll be able to print it out your personalized piece of art to display in your home. 4. Cross Stitch is 100% free to play. If you’re looking for relaxing free games which you can download into your PC free of charge, it’s well worth trying out Cross Stitch. Tip – Don’t feel a need to rush! Unlike most games which feature strict time limits in order to successfully complete each stage, there’s no need to rush when it comes to completing the patterns which you select as you’re not being timed. Instead, relax and take your time as game is meant to be a relaxing and a break from stressful games which are full of targets and time limits. If you’re interested in downloading a refreshingly relaxing PC game which you’ll find addicting, it’s well worth trying Cross Stitch. Sometimes when playing Cross Stitch, bluestacks ask you fee to pay but gives you option to download some apps. Every time it asks you just select “Install apps” and continue using it free. I hope you enjoyed this article, please rate and share. If you have problems running Cross Stitch on your desktop or any other issues, leave a comment below.